But as we know, digital information is very, very different. It’s one thing to try to control the press, it’s quite another to do the same with the blog postings, YouTube videos, Twitter feeds, and emails of an entire citizenry. Given the explosion of arguably illegal or simply embarrassing information available to Google’s crawlers (cough, cough, Wikileaks), I’m rather surprised that worldwide government takedown requests haven’t grown at an exponential rate. But to me, the rise of government takedown requests isn’t nearly as interesting as the role Google and other companies play in all of this. As I’ve written elsewhere, it seems that as we move our public selves into the digital sphere, we seem to be also moving our trust from the institutions of government to the institution of the corporation. For example, our offline identity is established by a government ID like a driver’s license. Online, many of us view Facebook as our identity service. Prior to email, our private correspondance was secured by a government institution called the postal service. Today, we trust AOL, Microsoft, Yahoo, Facebook, or Gmail with our private utterances. When documents were analog, they were protected by government laws against unreasonable search and seizure. When they live in the cloud….the ground is shifting. I could go on, but I think you get my point. As we move ourselves into the realm of digital information, a realm mediated by private corporations, those corporations naturally become the focus of government attention. I find Google’s Transparency Report to be a refreshing response to this government embrace – but it’s an exercise that almost no other corporation completes (Twitter has a record of disclosing, but on a case by case basis). 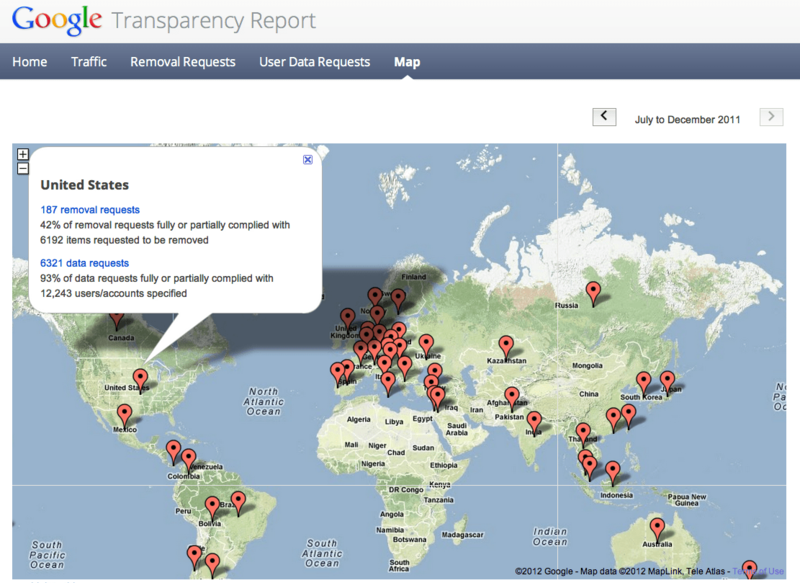 Where is Amazon’s Transparency Report? Yahoo’s? Microsoft’s? And of course, the biggest question in terms of scale and personal information – where is Facebook’s? Oh, and of course, where is Apple’s? Put another way: If we are shifting our trust from the government to the corporation, who’s watching the corporations? With government, we’ve at least got clear legal recourse – in the United States, we’ve got the Constitution, the Freedom of Information Act, and a deep legal history protecting the role of the press – what Jefferson called the Fourth Estate. With corporations, we’re on far less comforting ground – most of us have agreed to Terms of Services we’ve never read, much less studied in sixth grade civics class. Google is trying to make these decisions responsibly, and the outcome, as detailed in the report, is reason to have confidence in Google as an arbiter of these things if, as is the case, Google is going to be the arbiter of these issues. But unlike a US Court, we don’t see the transcripts of oral arguments, or the detailed reasoning of a judge. …The Transparency Report sheds more light on the governments Google deals with than with its own internal processes for making judgments about compliance….Google’s Transparency Report is the work of a company that is grappling with its power and trying to show its work. I applaud Google’s efforts here, but I’m wary of placing such an important public trust in the hands of private corporations alone. Google is a powerful company, with access to a wide swath of the world’s information. But with the rise of walled gardens like iOS and Facebook, an increasing amount of our information doesn’t touch Google’s servers. We literally are in the dark about how this data is being accessed by governments around the world. Google is setting an example I hope all corporations with access to our data will follow. So far, however, most companies don’t. And that should give all of us pause, and it should be the basis of an ongoing conversation about the role of government in our digital lives. Is Google doing all this with the hope that one day facebook and apple will learn something from them and open-up their wall gardens? Perhaps, but also, as a differentiator in the marketplace, and, I hope, because it’s the right thing to do. John, something to keep in mind here is that Google is only removing the search result links to the content and not removing the actual content. I’m not sure that falls into the censorship of content camp – it just makes it more difficult to find. It’s less troubling, but my issues are more with the companies who have no reporting at all. The idea that western governments are democratic or self-regulating is certainly niave. However, it is probably true that it is the best that we can envisage without the assumption of righteous absolute might on earth. Dictators there have been many (and some broadly benevolent) but righteous there have been none. Why ? because people are diverse and our best interests evolve. So therefore must effective governance. This implies that nothing be set in stone and a lack of moral absolutes, in so far as statutes obtain. In the absence of moral absolute (Godlessness – or for the atheist enlightenment), immorality flourishes, sometimes it gets a foothold at highest levels, and from there it is hardest to flush out. It has happened, is happening and will happen in any democracy. This is why the phrase “we have the governments we deserve” rings true. Sadly it is easy to forget that ideals must be fought for, legal rights are a privilege we are not born to, and with any right comes the responsibility to create an envirnment within that right can flourish.